Fluorine can be highly advantageous in compounds throughout the chemical industry, including pharmaceuticals, agrochemicals and devices. Its presence is known to improve bioavailability, stability and lipophilicity. Hence, around 20% of pharmaceuticals and 30-40% of agrochemicals on the market contain fluorine. Since natural sources of fluoroorganic compounds are extremely rare, advances in this area are heavily reliant on synthetic chemistry. 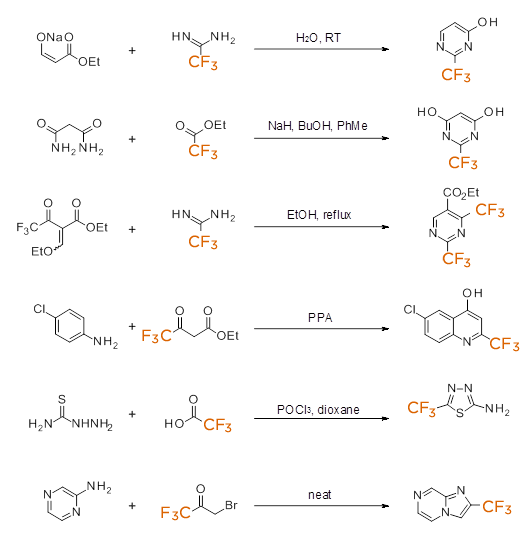 Manchester Organics have expertise in fluorination at all stages of a synthetic pathway - from building block synthesis to late stage fluorination. We routinely produce a wide range of useful and highly functionalised fluorinated fine chemicals for our continually expanding catalogue. Along side this, we provide expert consultation and highly efficient synthetic pathways for custom synthesis projects. If you require our services for fluorination projects, then we at Manchester Organics aim to become your partner for life. 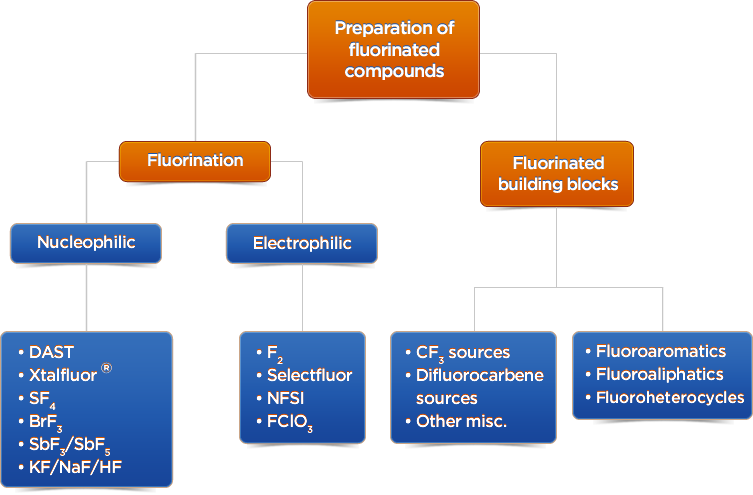 The diagram below depicts the basic strategy employed for fluorination and highlights some key reagents that we routinely manufacture and use. Sulfur tetrafluoride is a highly toxic and corrosive gas, which releases HF upon exposure to water or moisture. Despite these unattractive properties, it has been used to affect deoxofluorination reactions since the 1960s on a range of compounds. Due to the hazardous nature of SF4 gas, specialist equipment and expertise are required for its safe handling and use - both of these assets can be found at Manchester Organics. We have the ability to carry out reactions with SF4 from gram scale research to full scale commercial production. Furthermore, fluorinations of this nature can be conducted in our purpose built cGMP fluorination facility. 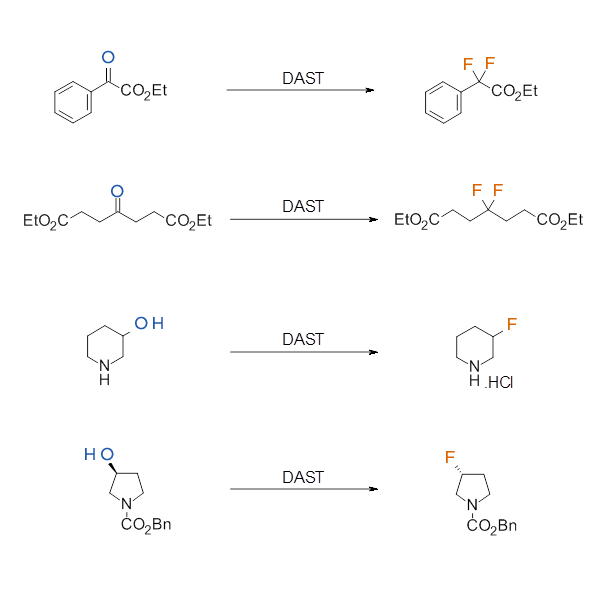 Some examples of SF4 mediated deoxofluorination reactions are depicted below. 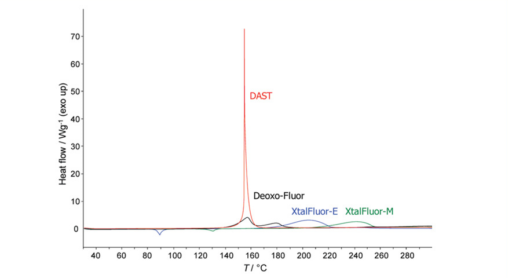 Diethylaminosulfur trifluoride (DAST) was the first major advance in deoxofluorination reagents developed from sulphur tetrafluoride. Unlike sulphur tetrafluoride, DAST is a liquid, which makes its handling, use and storage safer and more convenient. DAST was first used in the mid-1970s around 13 years after sulphur tetrafluoride first emerged. It shares some of the disadvantages of sulphur tetrafluoride, such as violent reactivity with water to liberate HF and thermal instability; decomposing explosively at elevated temperatures. It is, therefore, stored in a freezer to maintain quality, as well as for safety reasons. DAST is an extremely effective fluorinating agent, and is regularly produced in multi-kg quantities at Manchester Organics. Our state-of-the-art facilities and expertise also mean that this useful reagent is often used in a range of fluorination projects for our clients. 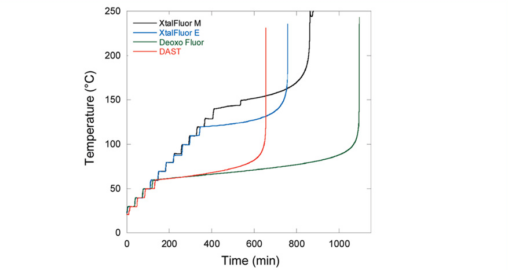 Some examples of DAST mediated deoxofluorinations are illustrated below. Hydrogen fluoride is the first product in the refinement of fluorspar (Fluorite, CaF2), the ore from which synthetic fluorides are created industrially. Though a highly toxic and corrosive gas, HF is incredibly important as a feedstock chemical for a variety of applications. At Manchester Organics HF is frequently used for a range of transformations. We have all the expertise and equipment to use HF safely and effectively, whilst minimising risk and environmental impact. As a group company of Navin Fluorine International, we are one of the biggest HF producers in India. HF is often used in vapour phase fluorinations, such as the examples shown below. Elemental fluorine is an extremely reactive, oxidizing gas; it should only be used by qualified individuals with specialist equipment and appropriate failsafe measures in place. When subjecting organic molecules to fluorine gas, selectivity can be difficult to predict and control. We at Manchester Organics, however, have considerable experience with this type of chemistry. 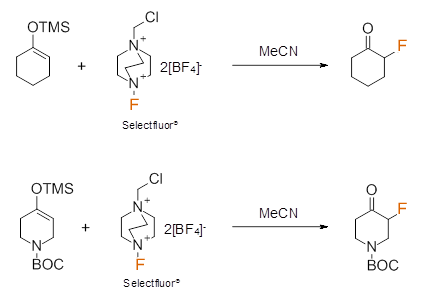 A direct F2 gas mediated fluorination and fluorination to furnish Selectfluor® are shown below. Electrophilic fluorine sources such as NFSI and Selectfluor® are also used to perform fluorinations at Manchester Organics. These sources of 'F+' are much less hazardous and easier to handle than deoxofluorination reagents like DAST and SF4. They are extremely useful reagents and have been reported to effect enantioselective fluorination alpha to carbonyl groups as just one example of a wide range of reactions with nucleophiles. Whilst Selectfluor® usually requires polar solvents such as MeCN for its reactions; NFSI can be employed in more general solvent media such as THF, broadening the scope of molecules upon which this mode of fluorination can be done. 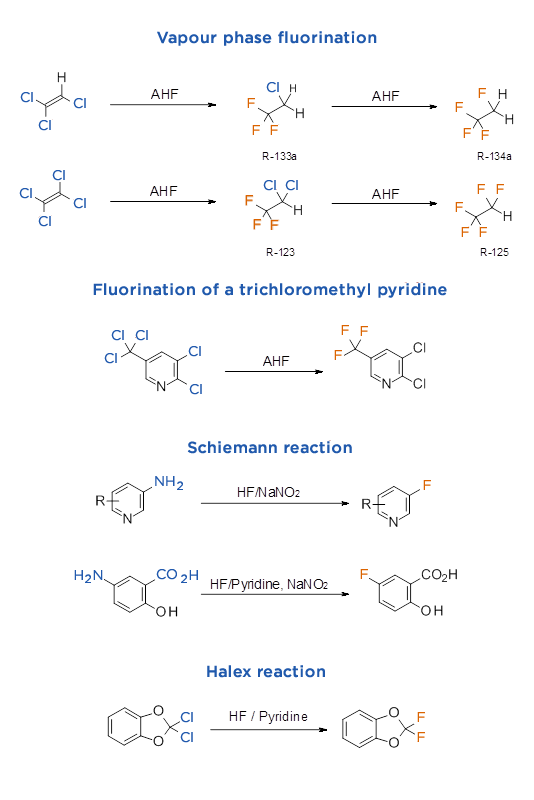 Examples of electrophilic fluorination are depicted below. Inorganic salts like sodium and potassium fluoride can be exploited as nucleophilic fluoride sources. These salts are much easier to store and handle than HF and so tend to be more widely used by chemists. The type of chemistry conducted with these salts is wide ranging; for example, as well as using them to add fluoride directly to a molecule, they also serve as useful activating reagents in reactions like Hiyama cross couplings. As fluoride sources, sodium and potassium fluoride can be used for the addition of fluoride in nucleophilic substitution reactions. Some examples are illustrated below. 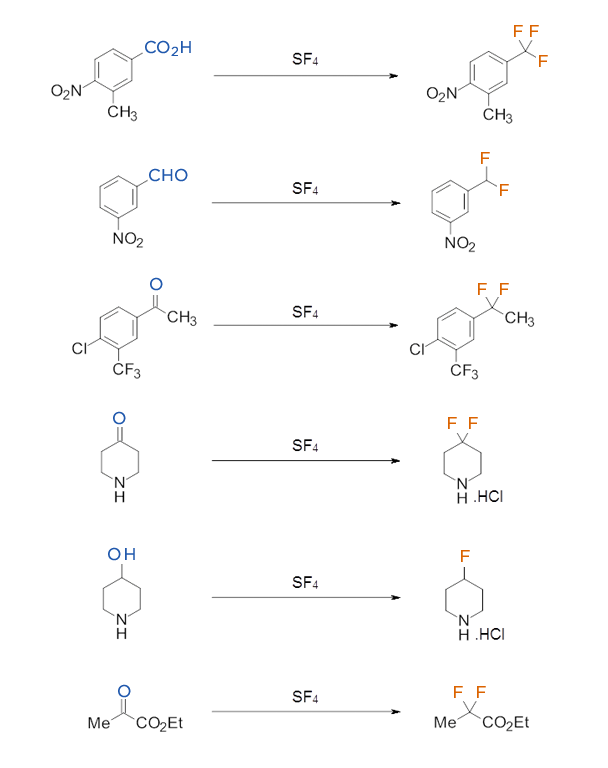 Rather than creating carbon-fluorine bonds directly, it is often easier and less hazardous to synthesise molecules from pre-fluorinated fragments. 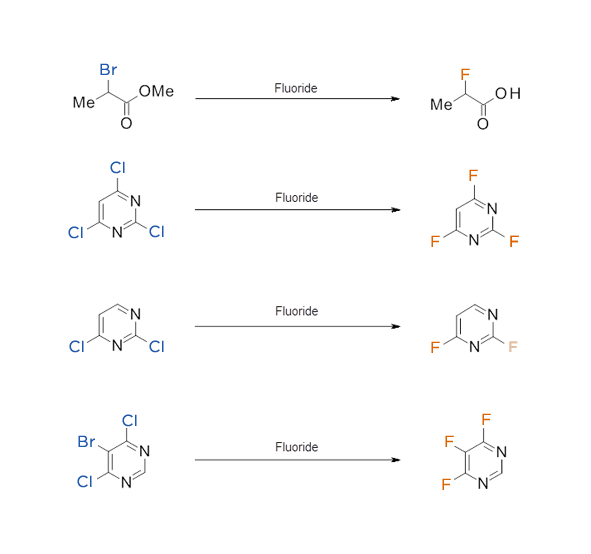 Manchester Organics list an array of fluorinated molecules for the synthetic chemist to use in imaginative ways to furnish new, useful compounds for research and manufacture. Our custom synthesis team can also provide bespoke fluorinated fragments for clients should the desired compound not be listed. Some examples of the diversity that can be created from these fluorinated building blocks are illustrated below.